Back in 2014 Natural Decisions worked with Spatial Vision Innovations on a project called NRM Planning for Climate Change. The project was led by the Corangamite Catchment Management Authority on behalf of seven Victorian CMAs. One of the key outputs of the project was a suite of mapping products showing modelled data and information on the vulnerability of natural assets under a range of different climate change scenarios and time-frames. The products can be accessed here. These products are just one of a host of materials available through the South-West Climate Change Portal, a collaboration between the local government authorities of south-west Victoria, the Corangamite and Glenelg-Hopkins CMAs and the Centre for eResearch and Digital Innovation. 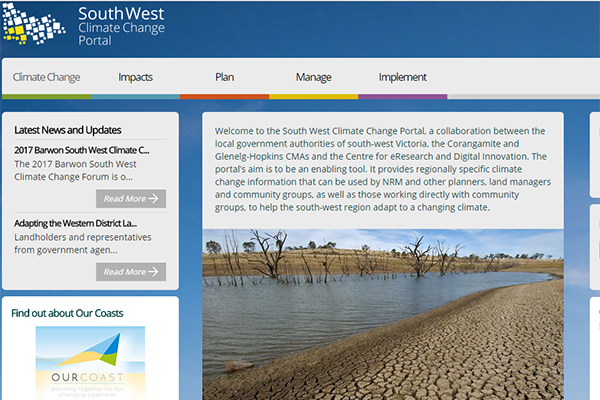 The portal’s provides regionally specific climate change information that can be used by NRM and other planners, land managers and community groups, as well as those working directly with community groups, to help the south-west region adapt to a changing climate.